Back in the spring the sows and Spits had migrated north to the North Field paddocks. On Sunday our Berkshire breeding boar Spitz and over sixty sows and piglets headed south across Sugar Mountain to new pastures closer to our cottage. 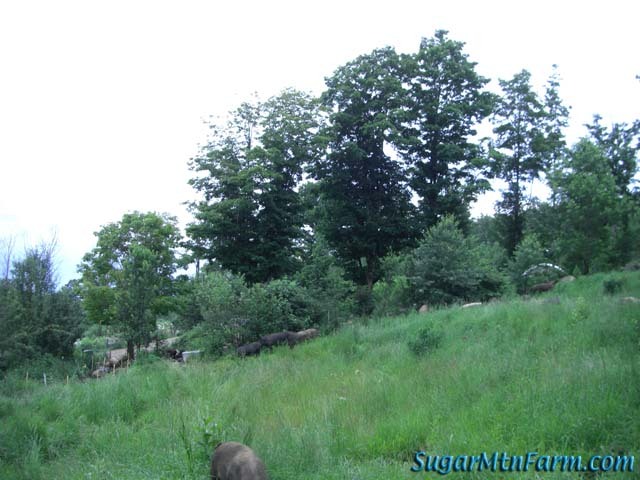 We began by simply calling in most of the northern herd down from the mountain and opened up the lush fresh ungrazed North Home Field pasture. Hog heaven. Will had setup the gates so they acted like ‘lobster trap‘ style funnel that the pigs will enter from one end but are unlikely to go back through. Instead they go up to the new pasture in the North Home Field. Pigs have a very strong homing instinct but it is instinct, not intelligence. This makes them very easy to control in mazes by setting things up to guide them to do the behaviors we want. Think of it as marketing for pigs. Once we had in those who came by voice Hope stayed at the gate with a bucket of treats of bread† while the rest of us headed across the mountain with sorting boards and herding dogs to pickup the stragglers. Most of these late comers are sows who were starting to build nests in preparation for farrowing or who had already farrowed and have little piglets. Most of this pasture in the North Home Field is grasses and clovers. The grasses are tall but quite tender right now – this is before they get to the stalkier stage so it is ideal grazing. The big breeders can handle the rougher forages but for smaller pigs the lower growths and more palatable grasses and clovers are better. If you find your pastures getting ahead of you and you don’t have big animals to graze it down then mow so new growth will come up for smaller animals. Even scythe work can do it. There are also some milkweed. You’ll find milkweed in many ‘toxic plant’ lists but it doesn’t seem to be an issue. It isn’t palatable or appetizing. Rather than eating the milkweed the pigs trample it down. Milkweed is pretty fragile. Like many weed species it does not hold up well to managed rotational grazing. However if a single milkweed plant blows to seed it can put out quite a large next generation. We have far fewer in the fields than we did before the pigs but the milkweed still pops up now and again. This is Spitz, our purebred Berkshire boar. He’s the boar of the north herd. We got him in early 2012. I had been interested in getting more Berkshire into our Mainline herd genetics for the additional marbling. Our Mainline herd genetics is predominantly Yorkshire crossed with Berkshire x Tamworth from over a decade ago. For over half that time we’ve been slowly mixing in Blackie’s line of Large Black. We’re also crossing Spitz to our Tamworth line and our second Large Black line. We have now begun taste testing the results of these crossings. The Berkshire (Spitz) x Mainline x Blackie cross is especially promising. It is a long process and it will be another decade before we see the deep results. This is the view from the bottom of the North Home Field which is made up of a series of terraces. The soil is thin. Where the black sow is standing you can see the exposed ledge. It makes putting in fence posts, er, challenging. 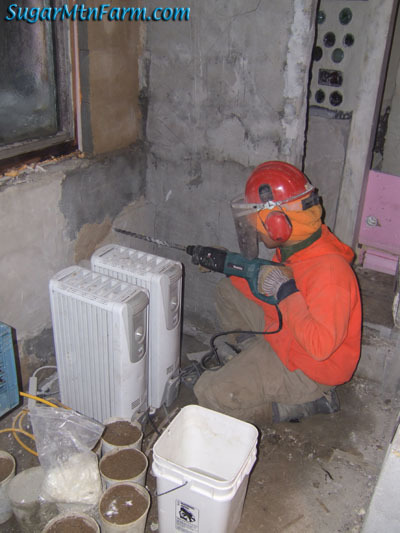 We often end up hammer drilling into the mountain. To the left in this photo you can see the lane that leads from the whey troughs and wallow out to the North Field from which we just moved the North Herd. After being out of rotation the lane will grow up in grasses and clovers so it’s ready for another round later in the summer. Up at the top of the field sharp eyes may spot the kids’s treehouse. 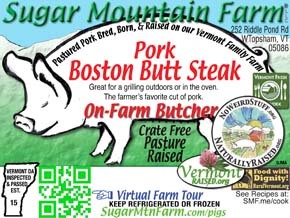 Click on the panorama photos to get larger views and a little mini tour of Sugar Mountain Farm. Daily Spark: Success is a trail speckled with failures. 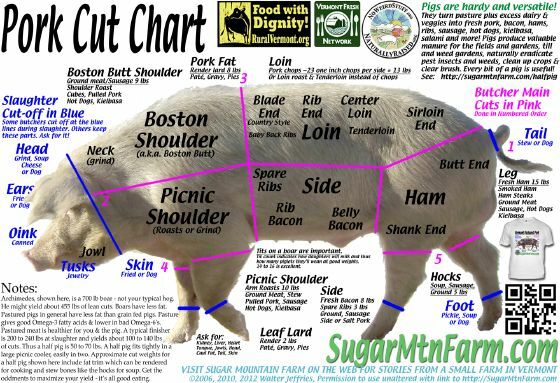 †Since our pigs’s normal diet is pasture and dairy which is pretty low in calories a piece of bread is a big treat for them. Pigs will follow you almost anywhere for a donut. 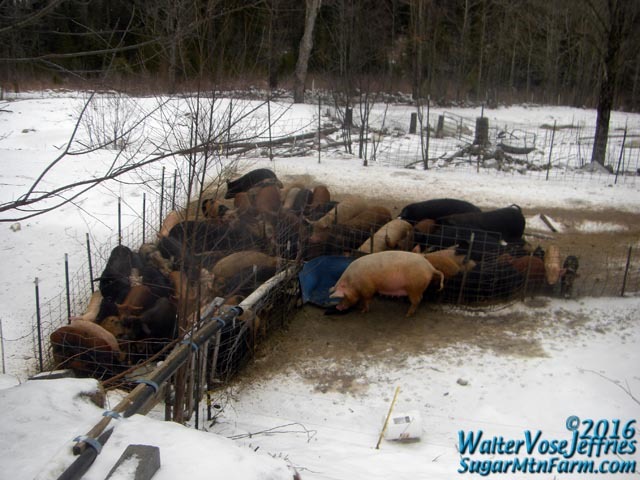 This entry was posted in Uncategorized and tagged Feeding, Fencing, Piglets, Pigs, Tour. Bookmark the permalink. Just popping over here to say ‘howdy’ and to thank you for this wonderful website, which I enjoy peeking at several times per week. I am a lawyer in Northern Ontario, and my Irish paternal grandparents had pigs on their small homestead that I remember visiting when very young. My fascination with pigs (especially heritage breed, pastured pigs) has increased over the years, and finally this summer I was brave enough to set up a one-week farm stay at a farm that raises large black pigs on pasture. I cannot wait! Thanks again for taking the time to publish all of this fantastic information! I enjoy your plays on words speaking as a wordsmith myself. Lovely photos that give me a wonderful view into life on your farm. It is delightful to see animals out on real pasture. I was curious how you moved the pigs from one field to another. Pigs tend to be quite stubborn and highly intelligent so moving them in a controlled manner can be problematic. They group together but they aren’t herd animals. I like the lobster trap reference. They like to feel in control so you can open a gate and they’ll stubbornly refuse to walk through it but put a hole in a fence and they’ll pour through like water. I like your layout for the lobster trap. It’s easy to open and reseal and it gives the pigs the feeling they are getting away with something like you were keeping the choice grass for yourself, kind of like raiding a garden. Always lots of great ideas on your site. Actually pig’s herd quite easily, perhaps even more easily than sheep who are the classic herd animal. I’ve hear people claim that pig’s don’t group or herd but they’re incorrect. 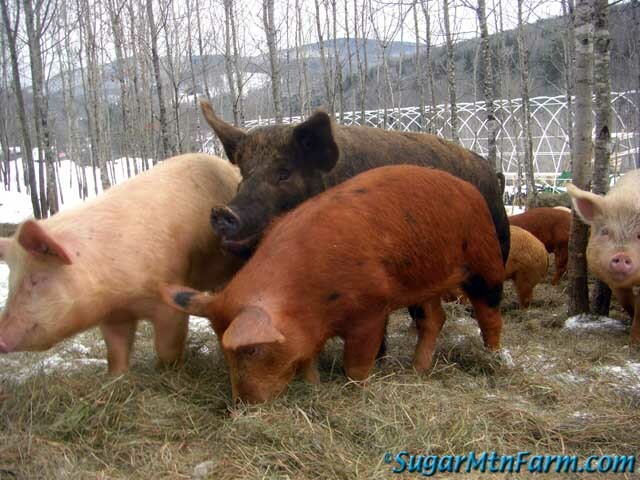 Pigs are very much herd animals and with a herd member’s mindset. I don’t think that our pigs are anything special in that regard. 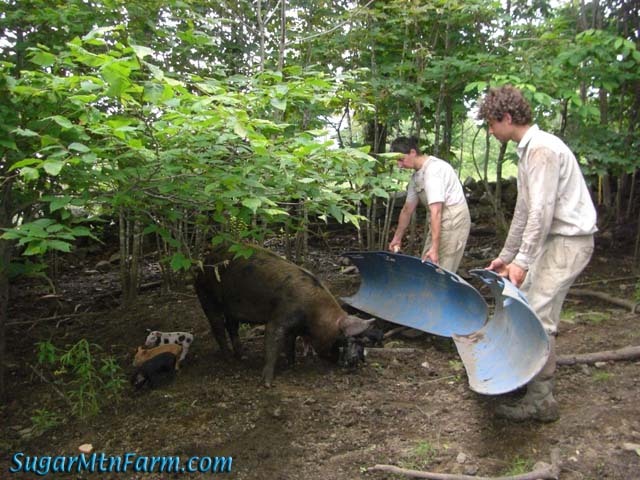 In 2012 we worked with pigs from someone else and we had no trouble herding them either. They behaved just as we expected from working with our pigs for many years. Pigs are not really all that intelligent – that’s another myth. They are very good at being pigs and those mental sets make them pretty easy to manage once you understand them. Movie magic in Hollywood makes pigs appear far better than they really are by training many look alike pigs to each do one part of a complex behavior and then they string the film together. Unfortunately that has given the public a false impression that pigs are actually like ‘Babe’ but they are not. It’s just tricks. Our working dogs are far more intelligent than the pigs. For herding there are a lot of little details, with all animal species and with any specific animal species, about knowing it’s psychology. For example, pigs like to move along a wall, be it a stone wall, a line of brush, a fence, etc – they feel safer. Pigs instinctually return to their home base and this is useful for designing gates and fences. 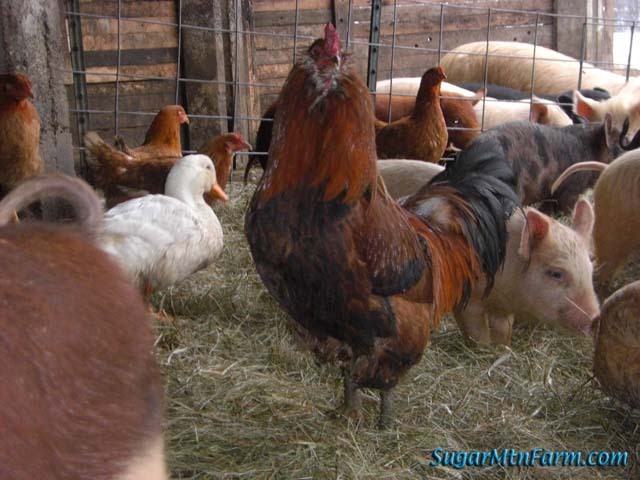 Pigs like to follow other pigs and to be part of a group – they’re herd animals. Pigs tend to be easier to move down slope than to move upward. When pushed too hard from the center pigs tend to scatter and turn – exactly like sheep. Sheep, cattle and cats all have similar things that once you know them makes herding them fairly easy, especially if you have good working dogs. Tools like the sorting boards and long thin sticks with some leaves on the end or a plastic bag are very useful too. I don’t think the lobster trap isn’t a gate like you’re thinking. Rather it is a narrowing, a funnel, that from one angle looks wide and inviting but from a different angle looks like a barrier. As the pig going the right way gets to the lip it makes the move through but once through is very unlikely to come back, just like lobsters in a trap. When they try to return home they end up taking the other wide route to the new pasture instead of going through the narrow entrance to the old pasture. It’s all psychology – Marketing 101 for pigs. You have no idea how helpful the little tips you give are. I don’t have herding dogs, just herding children. They aren’t as fast, don’t follow voice commands as well, and require ice cream for any job completed successfully. 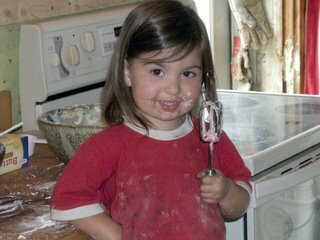 Having some experience to help me manage the process is critical. I’ve moved cows my whole life. Moving pigs is new to me. The time spent showing how you do tasks like moving pigs and pasture management is extremely helpful to farmers like myself. You are a big influence on how we are managing our farm Facebook page. We’re nowhere near your quality but at least you’ve shown the path. Thank you for all you do. *grin* Dogs love ice cream too. You certainly live in paradise. Love the big pictures! Pigs, up close and personal. So, while we’re myth-busting — and I was interested to hear your take on pig IQ — I feel compelled to point out that lobsters are excellent at escaping from lobster traps. The traps were designed without really knowing what happened out there in the deep. When cameras got to the point where we could send them down, the lobstercam showed that the lobsters would often come in, eat, and go out again. Some would get stuck, and others would simply opt to stay, as it was a safe place with plenty of food. We’ve pulled up many a trap with no bait and no lobsters. Aye, so I’ve read. There is a great book on “The Secret Life of Lobsters” that I read this winter which talked about the lobster cams and their propensity to get out. Very fascinating story and well told. For more on pig smarts see Of Pig Brains and Tea Cups.” Realize that pigs are very good at being pigs which is what they need to be. They’re just not the geniuses portrayed in movies. Why can’t the dogs do all the herding-work -like shepard-dogs? The dogs can and do herd the pigs all by themselves however I wanted to look at each pig. Out on pasture I do not necessarily see each individual pig each day. This is the opposite of penned pigs. When we move the groups like this it gives me a chance to inspect all the animals. My milkweed problem (which I didn’t really consider a problem) is solved by goats. I take them walking in the woods for an hour each day, where they are allowed to eat anything and everything they want to eat. Four years ago it was only one doe who would eat milkweed; this year it is almost everyone. And I have see zero negative effects, including no milk taint. I will say that they are never _forced_ to eat any plant, and that they have a wide variety of plants to choose from, thus the ability to choose other plants that will buffer the milkweed. In fact, I make it a point to manage my farm to encourage as wide a variety of plants as will grow. I think it’s working — they are very healthy and I haven’t had to deworm in more than two years. I have only two pigs, and no working dogs, so we rely heavily on bribery (treats) to get them to go where we want them to go. 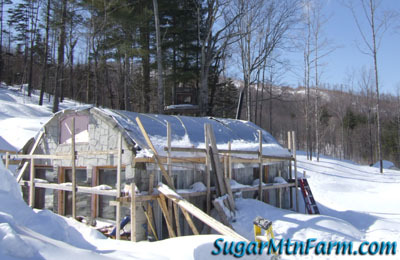 I am working on fencing the farm to set up a goats/pigs-sheep/fallow rotation. Milkweed–I realize you don’t necessarily want milkweed in your pasture, but the monarch butterflies depend on Someone letting the milkweed grow. And it’s getting kind of dire for the monarchs. I encourage some milkweed along my suburban stone wall just because the blossoms smell so wonderful and in hopes of helping a monarch along. One person’s weed, another’s flower…. Yes, that’s why I don’t try to eradicate it. I enjoy seeing the plant and the butterflies. However I don’t want it taking over either. There is balance in all things. 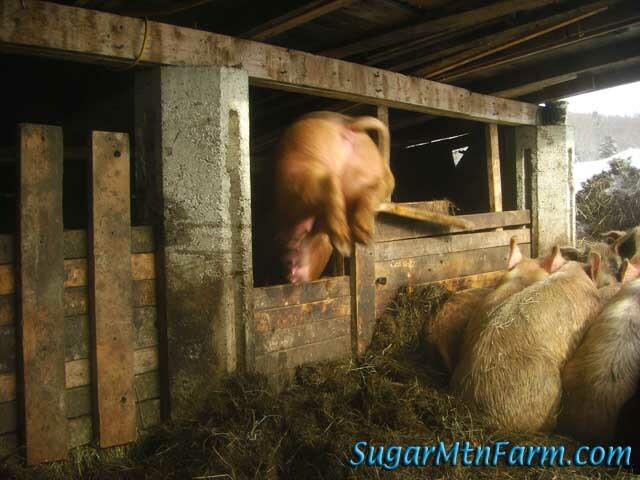 Do you make special considerations when moving pigs who are close to farrowing or have just farrowed? Would you allow a pig to stay put if she had farrowed the night before or seemed like she would farrow within a day? My guess would be that you move them all right along, but more gently with the ones in more delicate stages. Once a sow has farrowed she would stay where she is unless there is a really good reason for moving her. It is not they are delicate or anything like that. Out on the pasture a sow who’ll be farrowing in the next few days may well be walking a mile or two up and down the mountain. Rather the issue is homing. Sows home very strongly to their nests. In fact they are homed more to the nest than they are to the piglets. If she’s in the process of building a nest we can move her without out too much difficulty and she’ll rehome but once she has farrowed she doesn’t want to leave that spot for several days. Then after four to ten days post farrowing a sow wants to move her nest to a new area. So you’ll leave a just-farrowed sow even if the rotation scheduling has the rest of the herd moving? Then in a few days she’ll just wander up with her piglets to the fence to be with the herd and you’ll let her through? Yes, that’s how it often works out during the warm season up through October or even November some years. All depends on the weather, what paddocks they’re in, etc. As sows get late in gestation I like to shift them gradually towards the home fields so they’re closer and less likely to preyed upon by predators. 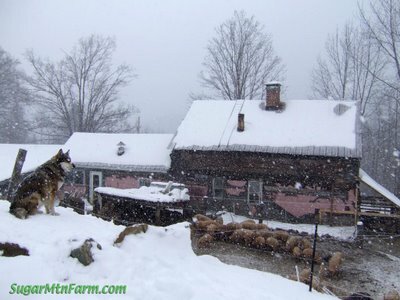 We have a large pack of livestock guardian herding dogs but they can’t be everywhere. By having the farrowing sows closer it puts the nests within the dogs’s central territory and thus easier for them and us to monitor. 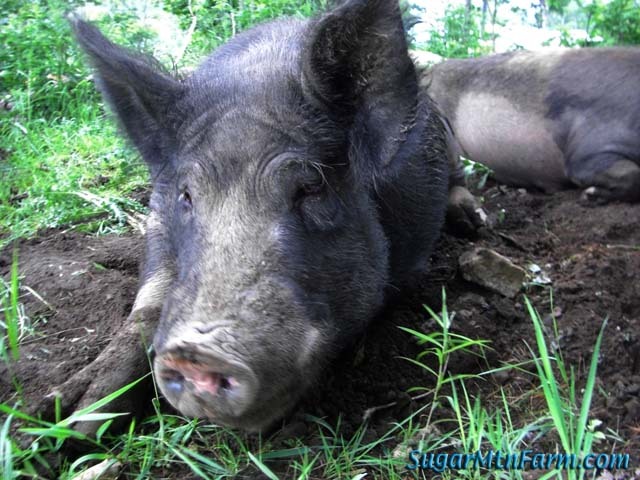 I’m curious if you’ve considered pig-cams, mounted on trees overlooking your fields. I know that bandwidth might be an issue for you, as far up in the mountain as you are, but a very low resolution streaming video might be doable. You don’t let a lot of people onto your property because of disease issues, but letting people see your pigs in action might be interesting. There might even be a university or two with agricultural programs willing to help you set up and host them, so their students can see pastured pigs au-natural. If you can swing it, a live camera feed of a small weaner pasture would provide an instant piglet fix for people too! Mostly it would be boring. 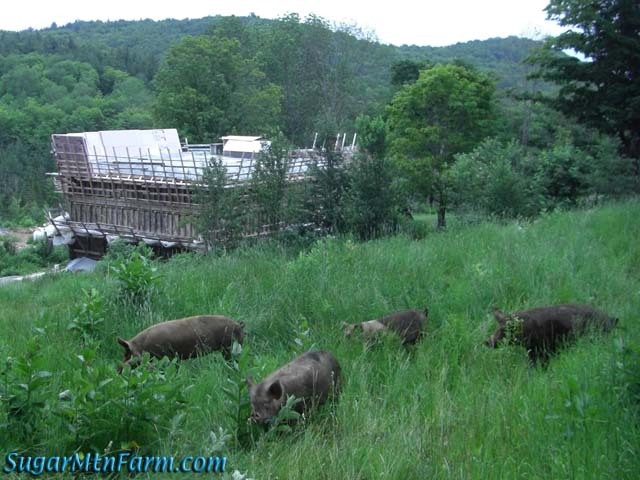 The pigs are spread out over about 70 acres in multiple herds. Rotational grazing means they might be on one spot for a day to two weeks. On the longer periods they’re very large pastures of up to 10 acres which means the density might only be 100 pigs so in any time period you probably will only see pasture growing. To make it interesting I would have to move the cameras around from pasture to pasture to follow the herds. 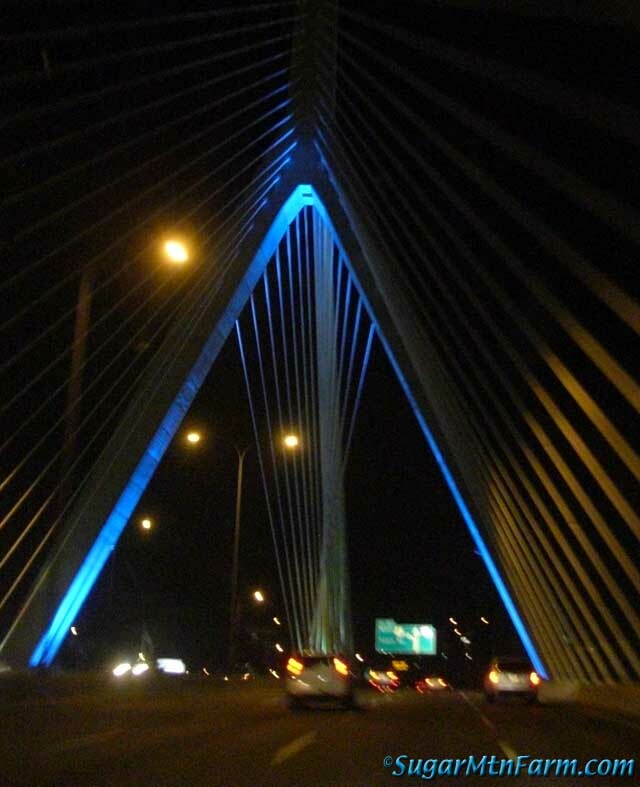 The wireless units don’t have the range to reach the distance so it would have to involve repeaters, thousands of feet of conduit installed electricity and more likely hard wiring the ethernet cables. If hard wired then I wouldn’t be able to easily move a camera to where the action (grazing paddocks) was happening. This means using a lot of different cameras and a fancy multi thousand dollar system. There is also the fundamental problem of getting the data, the images, from here to the world. We don’t have the bandwidth. We have a slow rural internet connection over twisted copper pair that is shared with our phone and it’s a poor quality connection. If we were running even one single live camera feed it would take over our connection. To host my blog I do it on a remote rented hosting platform because our internet connection here on the mountain is a very tight bottleneck. Then there is lightning. Ah, our dear friend Mother Nature has this habit of throwing huge voltages around. Electrical wires strung out in the fields act as antenna picking up the EMPs and frying equipment. We lose fence energizers and actual fence wire to this every year. Sensitive equipment like internet connected cameras would be even worse. As to naming our breeds, first we would have to have breeds. What we have right now are our own cross lines and pure bred lines of existing breeds. A line isn’t a breed until it breeds true. That takes decades to achieve. I don’t think I’ll ever be done tweaking them – it’s an hunt for that elusive perfect pig, a goal on the horizon that I am ever approaching. Until then we just refer to the various genetic lines such as Mainline, Blackieline, Mahoganyline, Redline, Fawnline and others in addition to our pure bred lines.